Though Brazilian Western shares obvious structural and aesthetic similarities with the titular western genre, capitalizing on the implicit structure of a morally ambiguous man taking on a corrupt populous singlehandedly, it's based more specifically on Legião Urbana's extended and (at the time of release) controversial song, "Faoreste Coboclo." This new wave folk song, released towards the end of the Brazilian Military Dictatorship in the mid-'80s, represented much of the angst burgeoning from an alienated and repressed youth in Brasilia. This is why writer and director René Sampaio's decision to set his cinematic adaptation of the song during this time, exploiting westernized tropes to heighten its relevance, reinforces the many political battles depicted within the film by framing them with a contextualizing, historically conscious shell that's respectful of influences and socio-cultural evolution. 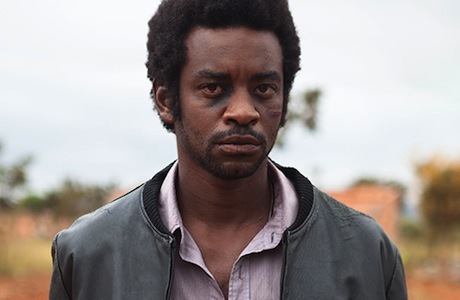 The cowboy, or instigator of change, in Brazilian Western is João (Fabricio Boliveira), a man raised within the vacuum of racism in the provinces, jailed at a young age for killing the cop that murdered his father. Once out of prison, he moves to the capital, taking up a carpenter's apprentice job with a distant cousin willing to help out on the condition that he moonlights as a drug dealer. That he's unable to escape the cycle of criminality associated with class system divisions is a murky political critique unto itself. But Sampaio, wanting to make something more epic of this loose adaptation, introduces Maria Lúcia (Isis Valverde), an architecture student and daughter of a senator that helps him evade the police during an early chase. Her status as a student designing the buildings that João would manually build isn't a mistake, which is noted and verbalized once the two strike up a doomed romance. Interestingly, though the police are a persisting, corrupt threat throughout this hybrid of western brutality (deliberately reminiscent of Sergio Leone) and '80s teen love triangle romance, the primary antagonist is Jeremias (Felipe Abib), an affluent competing drug dealer with a cursory involvement with Maria Lúcia. His seemingly incidental status, being the James Spader to João's Andrew McCarthy, reiterates the political climate at the time, making the class and racial divides clear in vilifying João for merely making the effort to assert his place in an exclusionary urban populous. Though the progression towards a highly dramaticized conflict—a highly stylized shootout that cleverly nods to its own genre constraints—is exceedingly formulaic, the effortless charm of the protagonist a highly propulsive, albeit not oppressive or abrasive, trajectory aids in generating visceral response. The romance, though avoidant of acknowledging the less than savoury motivations of Maria Lúcia, has enough chemistry to add an emotional component to the eventual bloodshed and metaphorical struggle to redefine the moral compass of an abject nation. Ostensibly, despite the occasional flaw in logic and some haziness in vacillating between lighter and darker tones, Brazilian Western consistently entertains. In universalizing the structure, capturing the essence of the external global pop culture influence on Brazil during a time of political change, there's a greater accessibility for an international audience to interpret and appreciate a narrative that has defined many nations at different times throughout history.